It's odd that the annual bicycle trade show takes place in Las Vegas, one of the most bicycle-unfriendly cities in creation. I shouldn't waste any more space on carping about Las Vegas. But I hate going there and I wish the Interbike show was held in a city that gave a rat's behind about bikes. There, I've got that out of my system. The main reason for this hillbilly's going to Interbike was to help Todd Linscott, owner of Torelli Bicycle Company, in the Torelli booth. I discovered in 2007, the year I sold Torelli to Todd, that working in the Torelli stand without having to do any of the really hard work of booth set-up and take-down (and getting catalogs ready, making sure prototypes arrived on time, ad infinitum) was a lot of fun. I always found transporting and erecting a trade show booth in the hot show hall (the air conditioning can't be run during set-up days because the doors have to open for deliveries) with smelly propane-burning forklifts being driven by hardworking people who nonetheless look upon the exhibitors as obstacles, not customers, to be an obnoxious chore. The show itself is fun, and this way Todd does the miserable stuff and I get to saunter in to the show with nary a single bead of sweat. 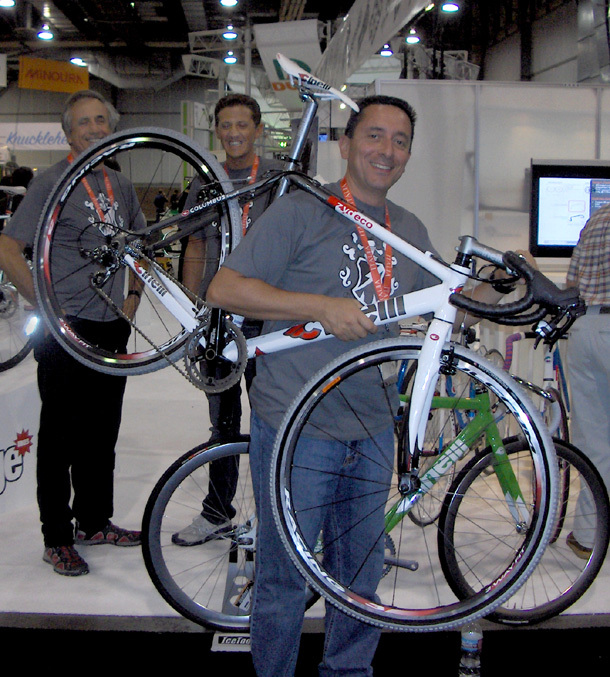 The 2009 Interbike show surprised almost everyone. The attendance from bike shops was excellent. While more dealers showed up than last year, the exhibitors, for reasons outlined below, were glum and sent fewer people to man the booths. And what was truly heartening, almost all of the bike shops, the real backbone of the bicycle trade, had a decent year. That made for a light mood in the hall. But not everyone was happy. There were wholesalers who still had with large stock of 2009 bikes sitting in their warehouses. They were miserable because the 2010 product, with the current fall in the price of commodities, was going to be cheaper than the 2009 bikes. The deep discounting was just beginning. Some firms postponed their 2010 bikes, letting the 2009 line role over into 2010. The net effect will probably be that for many companies, the 2010 product year will be a short one to allow 2011 bikes to come in by summer of 2010. I spent some time wandering the hall, visiting booths of friends and seeing what they had that was new for 2010. After the Mondonico family shuttered their framebuilding business at the end of 2005, Mauro Mondonico became the sales manager for Columbus, the Italian bicycle tubing company. Both Columbus and the Cinelli bicycle and accessory company are owned by Gruppo. Until a couple of years ago Gruppo also owned 3T, the stem and bar company, as well. 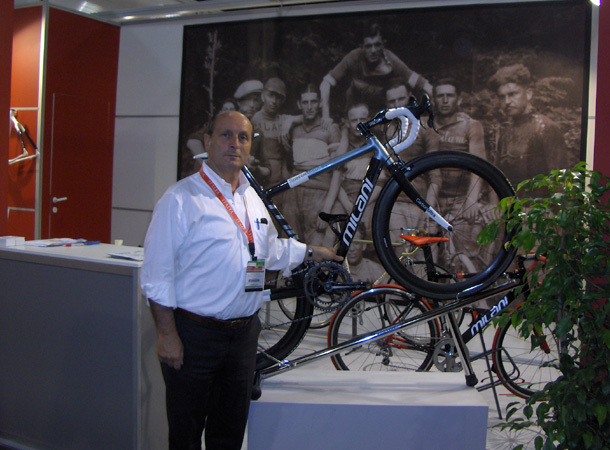 One of my first moves upon arriving at the show was to head over to BTI, the USA distributor of Cinelli, to see Mauro. Also at the booth were Fabrizio Aghito, one of Columbus' engineers, and the head of Gruppo, Antonio Columbo, whose family started Columbus back in 1919. Back in the early 1970s I wanted a Cinelli Supercorsa. I wanted one really, really bad, but I had no money and Cinellis were both rare and spendy. They were damnably hard to get. I think that at the time there were only 2 Cinelli bike importers in the USA. I think Cupertino Bike Shop was one of them. In an Olympic year Cinelli bike production would be sold out because national teams would purchase the entire year's production. In my area at the time there were 3 groups of riders. There were the Masi guys, the Cinelli guys and the Schwinn Paramount guys. The Schwinn guys would yammer on and on about the Schwinn lifetime guarantee, which persuaded no one looking for Italian beauty and performance. The Masi bikes were beautiful but for some reason, the Cinellis were the bikes I fell in love with. The Cinelli I finally managed to get was originally retailed in Singapore. When I first met Andrea Cinelli, son of founder Cino Cinelli, in 1981, he knew exactly which bike shop had sold my bike. Clearly, back then the business was small. By the way, Andrea gave me some photos from Cino Cinelli's racing career and they are posted here. Also, David Herilhy interviewed Cino Cinelli and I have that story posted here. The Cinelli Supercorsa. Still beautiful after all these years. I asked Mauro what was new at Cinelli for 2010 and he showed me 2 bikes. The first was the "Strato", a sub-950 gram frame that Cinelli says has the highest stiffness to weight ratio of any of their frames. Like nearly all modern carbon frames, it uses the BB30 bottom bracket and has a tapered 1 1/8"-1 1/2 headtube. 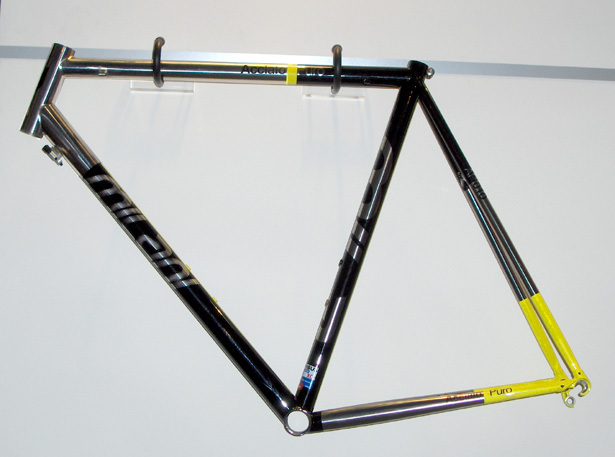 The frame is mated with a Columbus Genius carbon fork. Suggested retail for the frame, fork and headset is $3,899.00. The Cinelli Strato held by 3 guys from Italy. From left: Fabrizio Aghito, Mauro Mondonico and Antonio Columbo. The other bike was the "Zydeco" cyclocross bike. It's made of Columbus Zonal aluminum tubing matched to a Columbus Tusk fork made with extra clearance for muddy fat tires. It has a specially shaped flatter section on the top tube to make carrying the bike more comfortable. The frame weighs 1480 grams and the fork tips the scales at 680 grams. Suggested retail for frame, fork and headset is $1,149.00. There's no mud in the show hall so Fabrizio can't really put the Zydeco through its paces. One of the happiest pieces of news for me from 2009 Interbike was learning about Milani Cycles. I was talking to Mauro Mondonico and he told me I must go talk to Mr. Milani because he made his carbon frames in his shop in Milan. 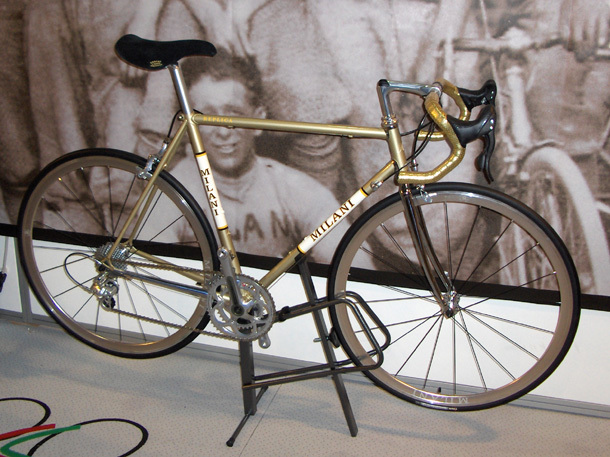 Also, Milani continues to hand-craft fine steel frames for those who love the feel of a good Italian steel bike. The reader might be aware of my deep sadness at the loss of so many Italian artisan shops that supplied the world with the greatest bikes the world has ever seen. Like most of the rest of the world many Italians, in a fight to remain price competitive, have chosen to have their products made in Asia. Not Celeste Milani, whose shop was started in 1927 by his father, former racer Natale Milani. He does more than just glue Asian carbon tubes together in his shop, as some builders do. He cuts the carbon pre-preg fabric sheets on his own sophisticated machinery, molds and cures his carbon frames in his own autoclave. To me this is a very big deal. Italian craftsmanship is more than the initial design sent elsewhere and then a good paint job when the off-shored bike comes to the shop. It entails overseeing the manufacture of an item from start to finish with an artisan's eye, making sure that every step of the production meets the builder's demand for high quality. Perhaps (and I profoundly hope this is true) Signor Milani is on the cutting edge and will be among the first of other italian builders who will bring more of their production back in-house. Celeste Milani poses with his top-of-the-line Specialissima carbon frameset, handcrafted in Italy. 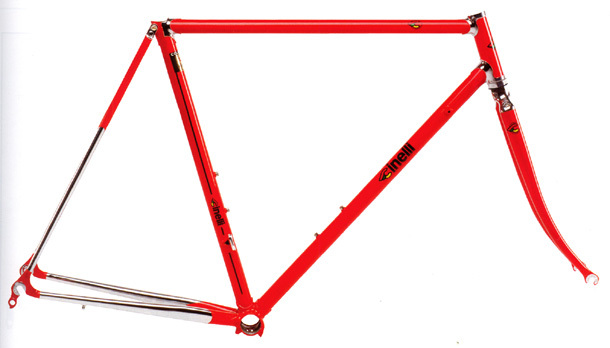 Milani also makes steel frames, some looking forward, some looking back. Signor Milani believes the Columbus XCr stainless steel tubing is the current state-of-the-art in steel. His Acciaio Puro (Pure Steel) is a beautiful example of how elegant a modern tig-welded steel frame can turn out. Look Ma, no chrome! No rust, no chrome, just a beautiful steel frame made out of stainless steel. Signor Milani is passionate about his family's heritage and loves everything about cycling and cycling history. In keeping with that sense, he builds a lugged steel bike that recreates, with modern building techniques, the frames his father built. The Milani "Replica" with classic chrome lugs. Note the modern Campagnolo group coupled with the chrome-plated, steel threaded fork, San Marco Concor saddle, retro decals and quill stem. I'd have used regular 36-spoke wheels, but that's a small quibble. Here's the link to the Milani site. I asked Bengt Friberg, Limar's export manager, what he had that was really new and really exciting. He was ready with what Limar says is the lightest helmet in the world, the Ultralight Pro 104. You European readers will get to buy a 170 gram version but the American CPSC standards mandate a little more shock absorbing capability before we go out and defy the world of Hummers and Escalades. The Euro version is available with an optional carbon insert for more protection. That 25-gram carbon insert is what brings the helmet up to US Govt regs and gives U.S. bikies a 195 (in the medium, 53-56 cm size) gram helmet. It was a bit of a surprise when I picked it up. It is really light. Most high-end helmets seem to weigh in at the 250 - 275 gram range so this is considerably less mass to carry around on the 'ol noggin. Things have sure come a long way from the Bell Biker hard shell brain buckets of the 1970s that might have weighed 2 pounds. A feature this Arkansas rider noted and liked was an insect net covering the helmet's 22 air vents. I think most riders have at one time or another had an angry buzzing captive creature ruin a good bike ride by delivering a painful sting or bite. Anything that will keep them out is welcome. 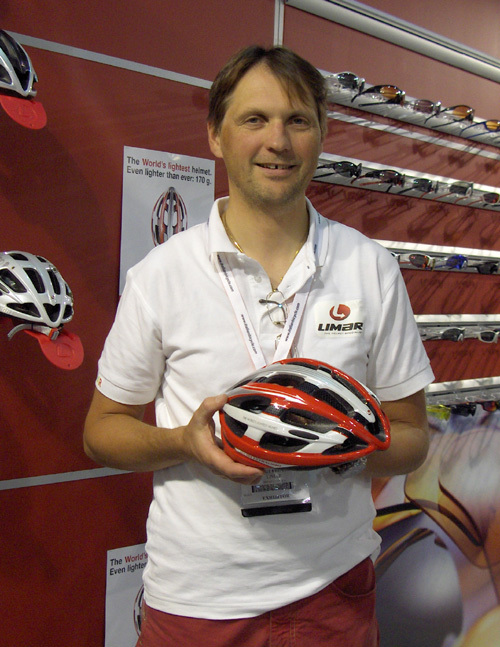 Limar sales manager Bengt Friberg holds an Ultralight Pro 104 helmet. US suggested retail price: $208.99. The Limar Pro 104 should be available around January 2010.